DECEMBER 5, 2018 -- Hello everyone. My name is Cindy Legg, from Beacon Valley Grange. I am the new director of CWA/Family Activities Committee. My committee includes Anne-Marie Knochenhauer of Groton Grange, Claudia Sopstyle, Enfield Grange, and Pat Tarca of Cawasa Grange. November 7, 2018 -- The following are the Connecticut winners at the New England Grange Building Needlework Contest at the Big E.
• Make a short report at each regular Pomona meeting. • Promote all contests within your Pomona. • Assist the State Committee when requested. • Send annual report to the State Director by September 15th. • Report at each regular meeting. • Explain and promote all contest and projects. • Put on a program (or part of a program) for the Lecturer. • Encourage your Grange to contribute monetarily to the State CWA projects. • Send copies of the annual report to the Pomona Chairman AND State Director by September 1st. 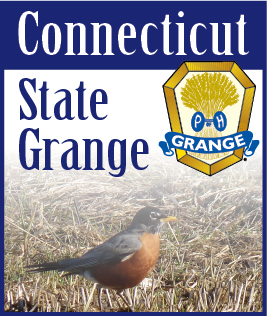 Visit the Downloads page to find numerous brochures, posters, forms, and more available for download for all aspects of the Grange in Connecticut. Family Activities News: Don't Forget Comm. Serv. Family Activities News: Decorate Those Caps! Family Activities: Urgent - Big E Items Needed! Family Activities: Big E Items Needed! How are your entries coming? Welcome to spring - hopefully! You can “take flight” with us! We wish the best of everything! Are your creative juices sparked? We’ll see you at Session! Contest Reminders - Time to Prepare! A Stitch In Time … Is it May already? The melody will linger on! CWA: Your Foster Care Memory Books are much loved and needed! Service, Contest Judging, Lunch, Talent Run-offs, Program and more! Become a Facebook Fan & MySpace Friend, watch our videos, and follow our tweets!